Technical problems can frustrate any live musical act, but for electronic artists it’s much worse than a broken string or blown amplifier. Sonically speaking, the zeros and ones are beautiful — and cruel. Computer crash = show over. 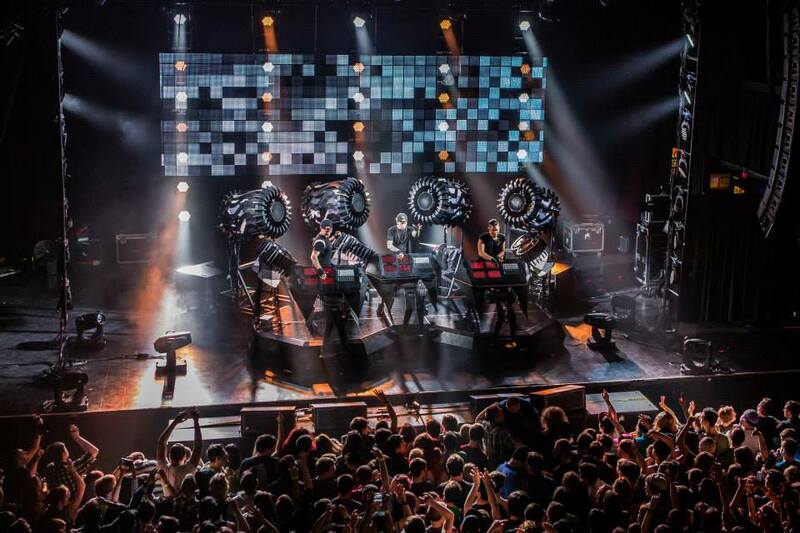 Justin Boreta of Los Angeles trio the Glitch Mob, which headlines a sold-out lineup at the Roseland Saturday, May 23 with EPROM and Danny Corn, laughed when asked about actual glitches in their live shows. A seven-minute reboot at the 9,525-capacity Red Rocks amphitheater? Bad, but the worst was a Nashville show that left dancers cold. These days, the group — Boreta, edIT (Edward Ma) and Ooah (Josh Mayer) — is “unflappable,” Boreta says, able to laugh at past missteps. They perform on a custom-built system, “the Blade,” which features layers of redundancy. Made with jailbroken iPads and unique musical and lighting controls, tilted to be seen from the audience, the Blade helps make the group’s live shows more accessible, and energetic, than most in the burgeoning EDM scene. On May 13 the group released a 3-D remix of a 2014 Metallica tune, “Lords of Summer,” that trades classic rock guitar and vocals for wicked phase effects and huge bass cliffs. In February they dropped “Love Death Immortality Remixes,” a nuanced reimagining of their 2014 release, which hit No. 13 on the Billboard 200. Featuring EDM heavyweights like Bassnectar plus newcomers includuing Austrian teenager Filous and singer Yaarrohs as well as Chrome Sparks, whose track Boreta said was his favorite, the remixed songs improve upon woofer-shaking originals by sussing out melodies. The Glitch Mob’s first album, 2010’s “Drink the Sea” was the emotional product of what Boreta called a “multi-year funk” for the band’s members. It became a cult favorite, a slow burner that paved the way for TV and movie contracts including Spider Man, Sin City and Captain America. In a recent phone interview, Boreta said the Glitch Mob was back in the studio, though he declined to share details. Whatever their next release, it’s likely to build on the trio’s signature dark-chilly sound and DIY ethos — they have their own record label, Glass Air, and licensing company, Zync Music. Using the Blade means toting a sizable crew and a semi-trailer, Boreta said, and higher expenses for the group. “We just want to create the biggest, most insane live show ever,” he said. “We used to make more money (on tour) when we were just guys standing there with Ableton,” a music software program. These days, though, they’re more ambitious — headlining the X Games Austin with Metallica and Nicki Minaj. Boreta sounds genuinely excited when he talks about the tour stop in Portland. Perhaps the Glitch Mob’s tattoo-friendly, digital wizardry resonates in our famously independent city. Or is it the food carts? This article was published in the Oregonian / Oregonlive.